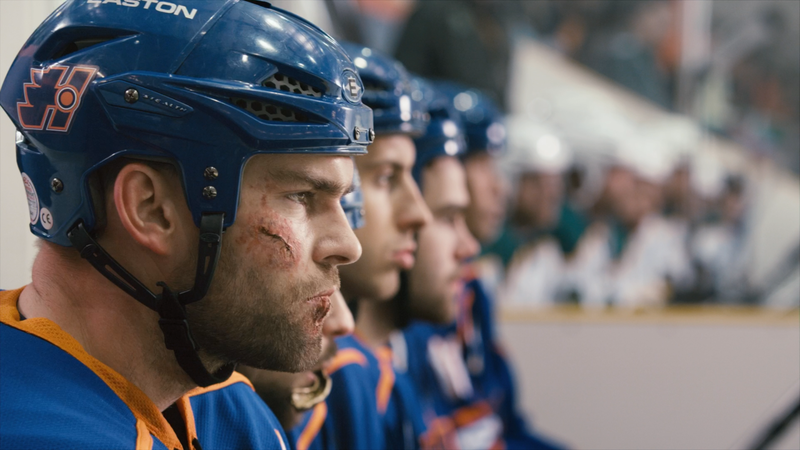 Goon, screening as part of next month's Possible Worlds Canadian Film Festival in Sydney, is a film that took me by surprise. For some reason this story about a regular guy; a bar bouncer from Massachusetts with no hockey experience, who becomes a newsworthy sensation because of his unique ability to hit hard and protect his teammates from opposing thugs, works in more ways than you would expect. Especially for a film written that is co-written by Jay Baruchel (along with Evan Goldberg, Superbad, Pineapple Express) and stars Seann William Scott (American Pie). Michael Dowse directs this enjoyable, intermittently shocking and fast-paced sports comedy and character study, serving up plenty of rowdy laughs, a solid dose of exciting hockey action and bone-crunching brutality in equal measure. Doug Glatt (Scott) is not a smart man. He’s a kind-hearted but dimwitted individual who has accepted that his role in life is to bounce at his local bar and protect and serve. He has rescinded to the fact that he will never be anything more, despite a desire to become something his father (Eugene Levy, American Pie), a doctor, would be proud of. To him, Doug is a maladjusted disappointment. When Doug attends a minor hockey league game with his friend Pat (Jay Baruchel, She's Out of My League), a hockey nut with his own video blog, Doug finds himself in the spotlight after knocking out a player from the visiting team who climbs into the stands to beat up a taunting Pat. Soon after, Doug gets a call from the coach of his hometown team and is offered a job as an enforcer. His role: deter rough opponents and protect his teammates. As his reputation grows, Doug soon finds himself in Canada, a new member of the struggling Halifax Highlanders and the roommate of talented young prospect, Xavier Laflamme (Marc-Andre Grondin, C.R.A.Z.Y.). Laflamme, a former top draft pick whose life has spiraled out of control, is stuck in the minor leagues after struggling to recover from a serious concussion a few years earlier. Doug is brought in to protect Laflamme and allow him to freely utilize his skills. His role becomes increasingly important when Ross “The Boss” Rhea (Liev Schreiber, The Manchurian Candidate), a veteran enforcer, is relegated to the minors after a vicious slashing incident. Rhea, nearing the end of his career, was responsible for Laflamme’s injury, and becomes both a man Doug respects and fears. We watch Doug’s role in Highlander’s sudden success, his rise in popularity and the relationships he builds with Laflamme and Eva (Alison Pill, Scott Pilgrim Vs. The World), a local girl who catches his eye. 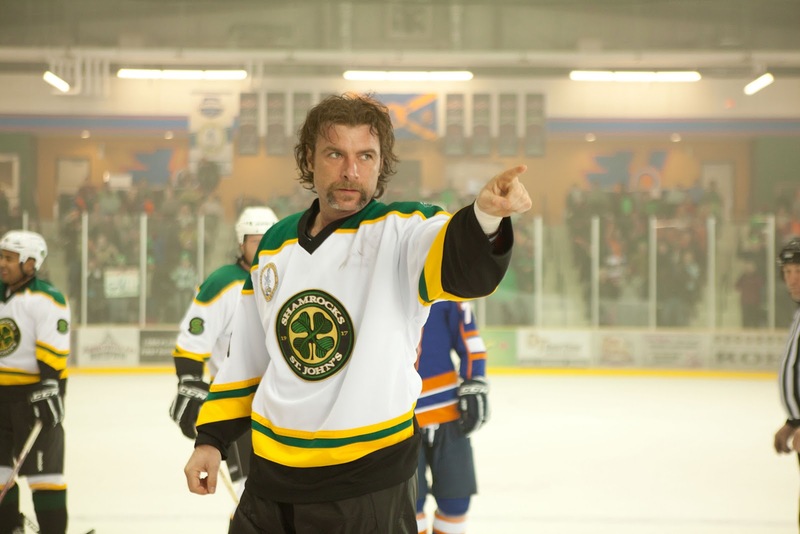 I understand some of the inspiration for this film was drawn from actual teams (the Philadelphia Flyers and New York Islanders) and significant events of violence in ice hockey history. Baruchel and Goldberg adapted the story from the book Goon: The True Story of an Unlikely Journey Into Minor League Hockey by Adam Frattasio and Doug Smith. 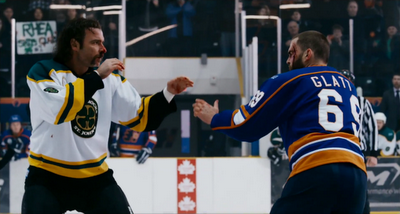 Goon is very well cast. Grondin, Schreiber, Kim Coates (as the Highlander's coach) and Scott are all perfectly suited to their roles. Scott was very good. 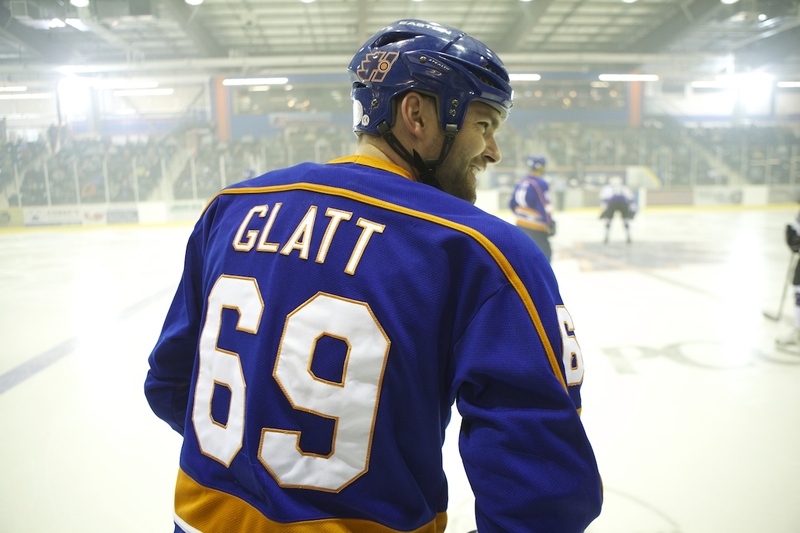 Doug Glatt is predominantly a straight man role and Scott has always had the capacity for more than Steve Stifler, though the depth he brought to the character in American Reunion was easily the best feature of that terrible film. He is thoroughly convincing as a brute, yet still has great comic timing. There are some very violent punch-ups, which display flashes of his internal frustration and devastating commitment to following the exploitative orders he is given. Doug feels great shame at the injury he causes his opponents, and continually desires respect from his father who still views him as nothing more than a thug. The film has surprising heart, and it emerges predominantly through Scott's work and because Doug's limitations are established from the beginning. Thoughtful and kind, if naive, his attempts to court Eva are very sweet, but the way he is treated by her and Laflamme - jealous of losing ice time to Doug - would be tough on anyone, but it is tragic for someone with as much sadness and self-contempt as Doug has. All he knows is violence, and as the fights become tougher, and the obstacles in his life escalate, the more it becomes evidently etched on his face. Though brutal to a near-sickening degree, Goon is also very funny, utilising a blend of hockey-related humour, profane and vulgar macho/blokey behaviour (suiting the minor league atmosphere, if wearying) and balancing Doug's kindness with his dimwittedness. One minute you are amused by Doug's struggles on the ice, and the next you are wanting to look away as a player is pummelled into the fence and blood is splattered across the ice. The hockey footage is fast and exciting - and well shot, utilising some inventive angles and placing the camera in the thick of the action - and you genuinely feel each of the hits. 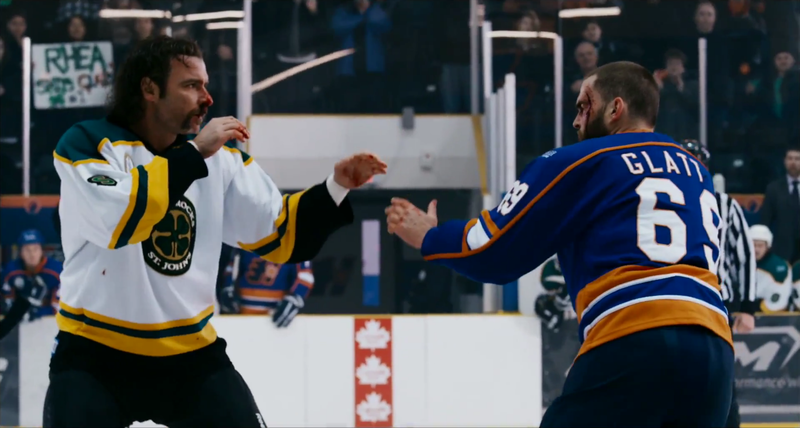 The only issues I had with the film were Jay Baruchel’s vulgar character, who was a bit much, despite taking on the role of ‘the’ passionate hockey fan who aids in Doug getting recognized, and the inconceivable final showdown. I don’t know all that much about ice hockey but I do not think a fight of this nature would be allowed to even take place, nor escalate to the level that it does. Some suspension of disbelief is necessary to get the most out of this film, I think, but it a film that pulls the punches in the right areas and it is easy to get caught up in. The pace of this film is swift; it always has energy and is never dull. It tells a familiar story but with a profane twist. Any time you laugh out loud and cringe in shock in close proximity, the filmmakers are doing something right. The reason it is a success is because of the excellent casting and performances, the fact that it is surprisingly endearing and heartfelt, and the way that the passion for hockey in Canada - it's the nation's biggest sport - shines through. It is a gem that will likely get overlooked. I urge anyone looking through the Possible World's schedule to give it consideration. Goon screens as part of Possible Worlds at Dendy Opera Quays at 8.30pm (drinks prior to the film start at 8) on Thurs. August 16. When I first heard of it, especially since it had Sean William Scott, I thought it was going to be a dumb comedy, so I had low expectations and didn't intend on seeing it. But ever since it was released, the reviews have been amazing, so it's on my radar again- maybe a DVD, since it's been out in the UK for a long time!